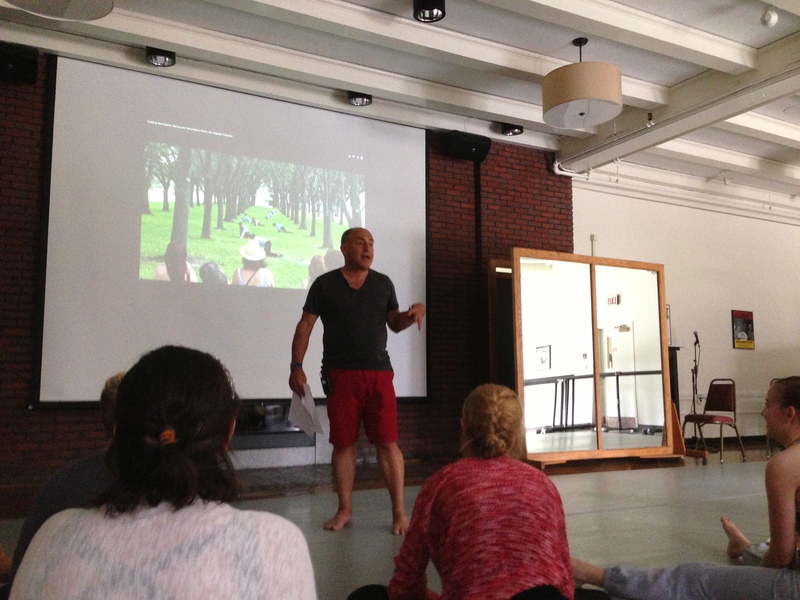 Stephan Koplowitz led a Show & Tell last night to discuss his prolific career creating site-specific works. Over the past 30 years he has created over 50 site-specific works and has been awarded 40 commissions. Stephen has even created works for the Bates Dance Festival and has worked with Director Laura Faure over the years to both create work in Maine, and other parts of the world. Yesterday we got a special look into some of the fascinating projects he has worked on that bridge space, movement, photography, technology and ideas seamlessly into these massive works. Koplowitz got his start when a long time friend Elise Bernhardt, director of Dancing in the Streets, asked him to be a part of a large project happening in Grand Central Station. Fenestrations, brought together 36 dancers to inhabit the windows of Grand Central Terminal. The work was an immense success and seen by over 16,000 people during their two evenings of performances. This project was what became a first in a large career of creating dance for architecturally interesting sites. Stephen Koplowitz leads his class on site-specific dance making in Chase Hall. Koplowitz has an amazing ability to think on a large scale. It seems as if he is constantly dreaming bigger and bigger. This has served him well over the years producing works that incorporate technology, video and photography. Koplowitz came back to his early roots in photography, to create camera obscura installations that were then integrated into site-specific performance. Last night we saw some of the amazing images his camera obscura project produced. The landscape is turned upside down and the dancers morphed into specters of light and dark. We also received a lot of keen business advice during the lecture. Able to clearly see the big picture, Koplowitz is constantly urging students to think as a producer would. Budgets, planning, and permissions are a huge part of what he is required to do as an artist. He says that 50% of the work is in the production and planning. It was awe-inspiring to see the sheer amount of works and ideas he has created since 1988. He has been commissioned by organizations and sites all over the world. To take a look at some of his work you can visit his website or check out his YouTube channel.